Where else in the UK can you clamber aboard a host of stylishly restored, recreated and retro-fitted rides and amusements from the Golden Age of British seaside hols? There’s more than just brilliant retro rides and amusements. Dreamland is a world where vintage cool holds hands with modern design, and goes for a lovely beachside stroll. Classics like the Scenic Railway, a 1920s Grade II listed timber roller coaster sit alongside a 1970s vintage dodgems, and even our Helter Skelter is just as you remember even down to the coconut mats. 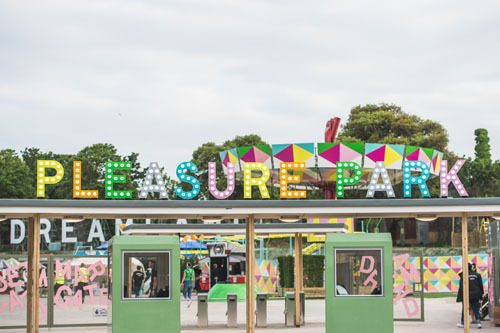 Everywhere you look, this wonderful sense of seaside magic brings rides, classic sideshows and traditional fairground games lovingly back to life. The inside spaces are just as exciting with an impressive Roller Room, which features a spectacular neon Roller Disco sign and a huge glitter ball overhead. The 1920s ballroom has been lovingly restored back to its former glory and is a great blank canvas. Considered to be the oldest-surviving amusement park in Great Britain, the site of Dreamland (as it was re-named in 1920) dates back to the British railway boom of the early 1860s when, in its original form, the ‘Hall by the Sea’ was operated by the famous circus impresario, ‘Lord’ George Sanger. Fast forward to 2003, when a plan to close the park and build housing on the site triggered a ‘Save Dreamland’ campaign. 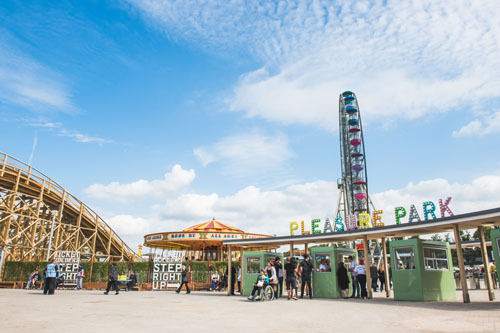 The Dreamland Trust emerged from the campaign, and worked with partners to secure £18m in public funding to restore Dreamland and its jewels: the Grade II*-listed Scenic Railway, Grade II*-listed cinema complex and Grade II-listed menagerie cages. In a bold move, Thanet District Council compulsory purchased the Dreamland site in September 2013 and work began in 2014 to restore the iconic Scenic Railway. New life was given to the lower ground floor of the cinema building, with sympathetic landscaping, exciting design and contemporary branding. In saving Dreamland, The Dreamland Trust, the local community and Thanet District Council managed something truly remarkable. Their hard work and determination has enabled generations to come and visit, and to enjoy this vital aspect of British seaside heritage, which without them would have been lost forever. Pay & display car park on site with multiple spaces available. Car Park access via Belgrave Road, CT9 1XG. The park has toilet facilities throughout the park. Dreamland has its own catering facilities and has a varied menu with a hot and cold food offer, hot and cold drinks, licensed bar areas, snacks, cake, ice creams etc.